Sakai Guides and DocumentationTeaching Assistant Guide Create Online AssessmentsWhat are the Availability and Submissions options for an assessment? In Availability and Submissions, you will find options including who should take the assessment, availability dates, and how many submissions are allowed. For more information on additional assessment settings, see How do I view and modify the settings of an assessment? In the assessment Settings page, click Availability and Submissions. By default, the assessment will be released to the Entire Site. 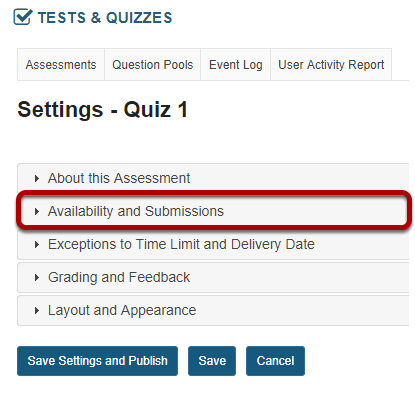 Alternatively, you can choose to release the assessment to Anonymous Users or Selected Group(s) within your course. The Anonymous Users option provides no information identifying who submitted the assessment associated with submissions. You can use this option to create anonymous surveys. If you release an assessment to Anonymous Users, you must distribute its URL to participants; it will not be accessible from within your site's Tests & Quizzes tool. The URL will be presented when you publish the assessment. You cannot change the Assessment Released To option on any published assessment. Enter the number of times students are allowed to submit the assessment, or choose Unlimited to let them submit as many times as they like. Tip: Unlimited submissions are often used for self-assessment, practice tests, or drills. The availability dates let you specify when your assessment can be accessed by students. By default, all the dates are blank. Use the date-picker (calendar icon) to select a date and time. The available date is the start date of the exam window. 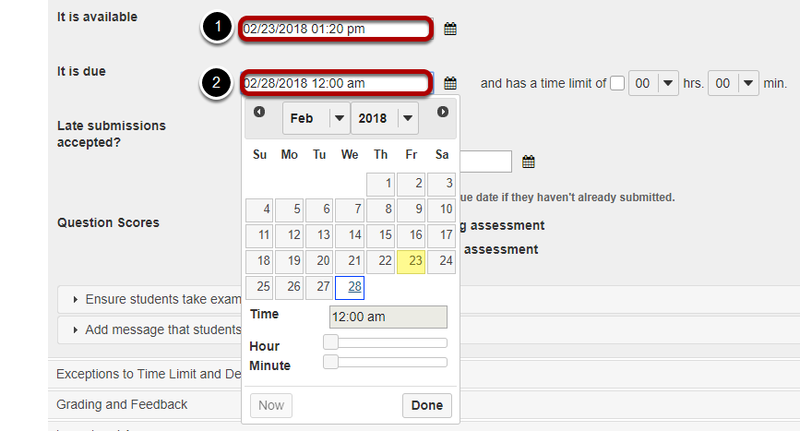 Students will not be able to see the assessment before this date. Publishing an assessment with a blank available date will make it available immediately upon publishing. The due date is the end date for the exam window. Students will not be able to submit after this date unless you accept late submissions. If late submissions are allowed, any submissions after the due date will be marked as late. Note: When you click on any date field, the date-picker (calendar window) will display. You can choose a date by clicking on it in the calendar, or by clicking Now. Select a time using the Hour and Minute sliders. When your date is selected, click Done. Under Late submissions accepted? you can accept late submissions by clicking the radio button to select Yes, until, then entering a late acceptance date in the adjacent date field. By default, late submissions ARE accepted. Use the date-picker (calendar icon) to select a date and time. If you do allow late submissions, submissions that come in after the due date will be marked LATE in capitalized red letters after their Submit Date. Note: Even if you allow multiple submissions, only one late submission is allowed after the due date, and it only applies to students who have not submitted at all. If you would like your assessment to be timed, select the check box next to the text has a time limit of and select a time limit in hours (hrs.) and minutes (min.) from the respective drop-down menus. Check the box to Autosubmit saved student work after latest acceptance date if you want assessments to be automatically submitted after the latest acceptance date. 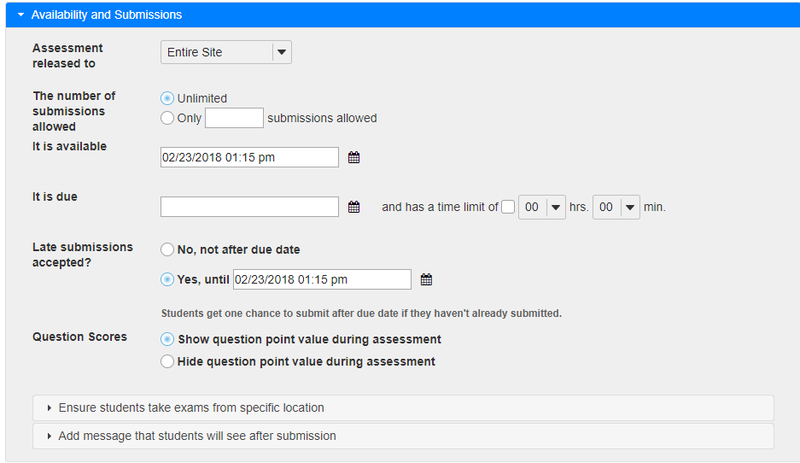 The Autosubmit setting forces the submission of saved assessments belonging to students who have started the assessment, but did not successfully submit their work before the latest acceptance date. All work that a student had saved will be included in their automatic submission. Note: The Autosubmit setting is only available if it has been enabled by your institution. By default, it is disabled. Choose the appropriate radio button to indicate whether or not you want to Show question point value during the assessment or Hide question point value during assessment. The default is to show the point value. For high stakes testing, you may want to provide additional security for your assessment. Click on the Ensure students take exams from specific location link to expand that section and display the following options. You may restrict the assessment so that only connections from certain IP addresses are allowed, such as a building on grounds. Enter one IP per line into the Allow only specified IP Addresses field. Asterisks may be used to stand for any single subnet. You may also specify a Secondary ID and Password for the assessment. This Assessment Username and Assessment Password is typically provided by the instructor in the classroom or testing center, so that students must be present to enter the assessment. If you want to require use of a locked browser when taking the test, you may select the Respondus LockDown Browser radio button and (optionally) enter an exit password. If you choose this option, your institution must have an existing subscription agreement with Respondus to provide the browser for your students. The default setting is None. Note: The Secondary Password is for this specific assessment, and NOT the instructor's or the student's login information. If you would like to enter a message that students see upon submitting their assessment, click on the Add message that students will see after submission link. The Rich-Text Editor is available if desired. You may include a Final Page URL if you like. The URL for this page will be displayed after the student submits the test. Prev: How do I create a new question (with the assessment builder)? Next: How do I give specific students different time or date settings for an assessment?